Ask fellow campers about "New Life RV Park" and nearby attractions. Question: Are there fire rings on the sites? Answer: Not that I remember. Convenient overnight stay off I-35. Most of the park looks like full timers, so spots may be few. We camped at New Life RV Park in a Travel Trailer. Most people live long term in the park, the owner is on site frequently; staff and campers are friendly. Grounds kept up well. Swimming pool, laundry facilities, club house. Rv storage area in back. Park is in a rural area but near interstate. 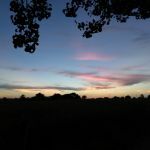 We camped at New Life RV Park in a Travel Trailer. Within biking distance to Berry Springs Park. 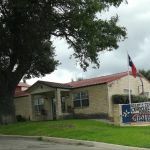 Close to Georgetown with local shops and big box stores, great sight seeing, library. Day trip to Waco, Austin, Brady, Round Rock, and Taylor, Granger. Georgetown has music on Friday nights in the summer around the courthouse square. This is a nice, no-frills RV park in a suburb of Austin. Gravel sites, very level. The pull-thru sites have plenty of room for big rigs. Our site had a large shade tree and picnic table on a concrete pad. Nice and quiet, all hookups worked except the cable TV (which we don't use anyway). On our arrival we noted that the water spigot was leaking bad, so we told the manager. It was fixed within the hour! If you're looking for a fancy-schmancy park with lots of amenities, look elsewhere. But if you want a quiet, clean park to hang your hat for awhile at an unbeatable price, look no further. Our monthly rate was $375 plus electric. We camped at New Life RV Park in a Motorhome. Plenty of restaurants and shopping nearby. This is a very nice no frills park on the outskirts of the Austin Metroplex. It is right off 130 and we were in Austin for 4 nights on business. The location made it very east for me to get in and out of Austin daily. If you like quiet and serene you'll love it here, very easy and nice folks running the place. No issues with traffic, noise and such. We camped at New Life RV Park in a Fifth Wheel. The rating is based totally on customer service. We called a full week ahead to reserve a spot for a two- night stay. The person taking our reservation didn't ask for a credit card to confirm it, but that's not totally uncommon. Upon arrival, however, we were told that we did NOT have a reservation and they could not accommodate us. The person in the office asked when we had called to make our reservation. We showed him the record of the call on our cell phone and his response was simply, "Well, I wasn't working that day". No apology or attempt to help us at all. So if you call to reserve make certain you get a reservation number, the name of the person and any other assurance that you will indeed have a place to park your rig! We camped at New Life RV Park in a Motorhome. Clean and basic RV Park. Entrance on paved rural country road yet convenient to shopping in nearby Georgetown, approximately seven or eight minutes to Walmart. No issues maneuvering 45 foot motorhome into and out of the park with tow car attached. 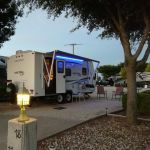 We camped at New Life RV Park in a Motorhome. Nice walking park named Berry Springs just down the road. Only stayed one night but give the park an overall excellent rating. Easy on and off I-35 (don't use the toll road!) ... a little preplanning is a good idea. I have a map program on the computer and use it to keep my GPS honest. They both agreed on the best route to the park. Park was neat, clean and friendly. Hookups were in excellent condition. Will definitely use it again. We camped at New Life RV Park in a Motorhome. Very nice and clean park on the outskirts of Georgetown. Host and staff are courteous. Residents here have well kept RV's. 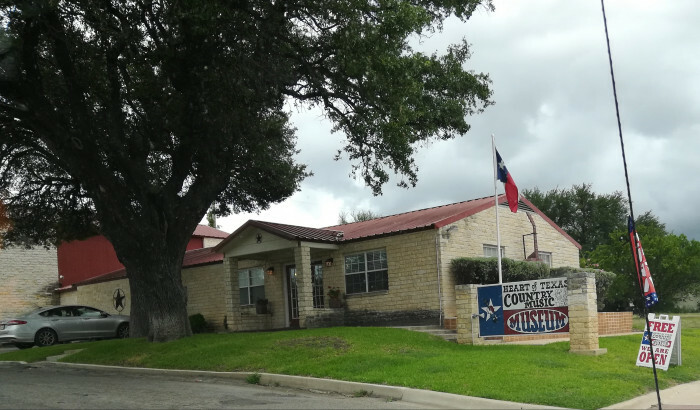 Very long pull through's This is a good stop for an overnight if traveling north-south on I-35 or for an extended visit to the greater Austin metropolitan area. As others have said, the approach is complicated by the arrangement of the SH130 turnpike/I35 interchange in the immediate area. Your GPS may even take you through a residential area, but it was no problem for my trailer. Payment is by cash or check. 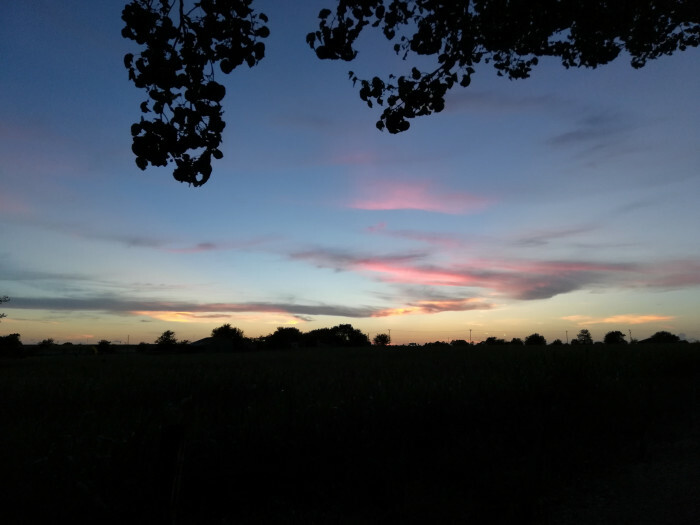 We camped at New Life RV Park in a Fifth Wheel. The best approach from Interstate 35 is using the SH130 service roads from the I35 service roads, exit 265 from I35N and exit 266 from I35S. Be careful and be sure to stay on the I-35 service road, there are a lot of ramps in this area. It's a good idea is to check out a map ahead of time. This was an overnight stop for us. Campground was clean and the sites were pull through . There was a pool and everythig looked very clean. There was a pig farm next door but we did not notice any smell from it. It was a little confusing figuring out the toll road to get to the park so be careful with that. We camped at this park in a 41' fifth wheel. 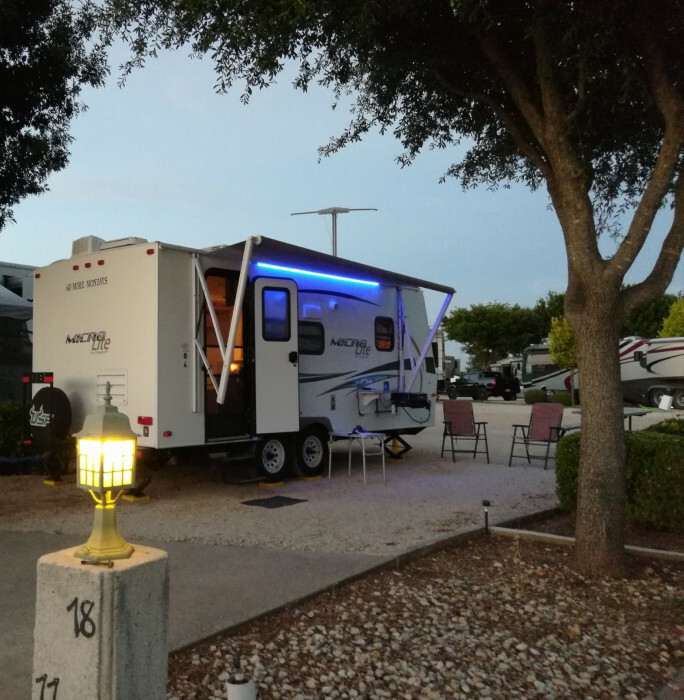 We camped at New Life RV Park in a Fifth Wheel. I called and talk to someone and he gave us a sight number. He did ask how many nights and that was all. In the morning, we are told that our sweet, lovable Shepard was not allowed. (A vicious breed). The owner was rude!!!! I went to check out and was told they only take cash or checks. The pool was OK, bathrooms and showers were private, but old looking and didn't look clean to me. I didn't use them. Some of the above information was not in their ad. Would never stay there again. We camped at New Life RV Park in a Motorhome. The park has a lot of long term residents. There is laundry on site, but the units are small. Many of the campground sites are small as well. The bathhouse was pretty gross and smelled. But what I found most disturbing was the rudeness of the owner....no customer service skills at all. Overall, this park is just OK. It seems expensive for the area, and lacks in clean facilities and customer service. We camped at New Life RV Park in a Travel Trailer. Nice clean park close to interstate. Sites are a little close but very long. The daily rates are great compared to other parks in the area. Getting to the park is a little confusing due to the proximity of the toll road. Nice little store with a tremendous amount stuff. We will stay here again. We camped at New Life RV Park in a Fifth Wheel. We spent 1 month at this park. It is really well laid out, very clean, very nice clean pool, great community room, and wonderful laundry room. The lady who works weekends is very friendly and helpful. Management took care of any problems we had immediately. The people who stay in the park (a few are full-time residents) are also very friendly. It was a really pleasant experience. We camped at New Life RV Park in a Fifth Wheel. Rate is based on a monthly rate. We stayed here for 2 months while visiting friends and having medical issues attended to. We are full timers. Would like to have rated this park much higher as it is good in most all areas, except "cleanliness". The restrooms are generally horrible and trashed daily by long term campers. Floors are mostly wet & muddy. Shower stalls are dingy and filled with hair. I was afraid to touch the shower curtains. Toilets were many times akin to a Rocky Mountain Horror Show! My wife quit using them. It would have been nice if paper towels were present so campers who cared could have helped in the clean up of the few that were slobs. A nice, inviting pool but it seemed to always require I skim an abnormally large numbers of bugs off the top before getting in the water. Then I met a young lady who was at the pool with her young children and we got to talking about the bug issue. She has had pools most of her life and suggested we check the skimmers to see if they had been cleaned recently. They were filled to overflowing! Sad to see such a nice park miss the mark on such basic and controllable issues. We will not stay here again because of the cleanliness problem. If you don't care to use the park facilities and use your own all the time, I would have no problem staying here again. We camped at New Life RV Park in a Fifth Wheel. Nice park very clean and manicured but very little if any shade, no grass to speak of and a lot of extended stay residents. Pads were concrete access roads gravel. Bathrooms and showers were clean most of the time. Several times the floors were wet and dirty but were cleaned up the next day. Very nice laundry. Pool and hot tub available and clean. Overall very nice park. The reason I did not give it a 10 was the lack of grass and shade and the pet areas were small. They have a very large grassy area that is going to be one of the pet areas but it is not fenced completely yet. Would stay again but not for very long. Big rig access not a proplem. Would stay again. We stayed three days. This park has one of the most well stocked RV supplies store I have seen at a RV park. We camped at New Life RV Park in a Fifth Wheel. 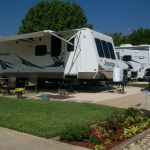 Are you affiliated with New Life RV Park ?